This struck me as related to some challenges in formulating what one should do — that is, in the “practical reasoning” side of ethics. One way of getting practical advice out of virtue ethics is to say that one should do what the virtuous person would do in this situation. On its face, this seems right. But there are also some apparent counterexamples. Consider a short-tempered tennis player who has just lost a match.2 In this situation, the virtuous person would walk over to his opponent, shake his hand, and say something like “Good match.” But if this player does that, he is likely to become enraged and even assault his victorious opponent. So it seems better for him to walk off the court without attempting any of this — even though this is clearly rude. The simple advice to do what the virtuous person would do in the present situation is, then, either not right or not so simple. It might be right, but not so simple to implement, if part of “the present situation” is one’s own psychological weaknesses. Aspects of the agent’s psychology — including character flaws — seem to license bad behavior and to remove reasons for taking the “best” actions. King and other characters in The Descendents face this problem, both in the example above and at some other points in the movie. He begins a course of action (at least in part) because this is what the virtuous person would do. But then he is unable to really follow through because he lacks the necessary virtues.3 We might take this as a reminder of the ethical value to being humble — to account for our faults — when reasoning about what we ought to do.4 It is also a reminder of how frustrating this can be, especially when one can imagine (and might actually be able to) following through on doing what the virtuous person would do. One way to cope with these weaknesses is to leverage other aspects of one’s situation. We can make public commitments to do the virtuous thing. We can change our environment, sometimes by binding our future selves, like Ulysses, from acting on our vices once we’ve begun our (hopefully) virtuous course of action. Perhaps new mobile technologies will be a substantial help here — helping us intervene in our own lives in this way. A less widely known reason for using within-subjects experimental designs in psychological science. In a within-subjects experiment, each participant experiences multiple conditions (say, multiple persuasive messages), while in a between-subjects experiment, each participant experiences only one condition. Why do within-subjects experiments increase power? Because responses by the same individual are generally dependent; more specifically, they are often positively correlated. Say an experiment involves evaluating products, people, or policy proposals under different conditions, such as the presence of different persuasive cues or following different primes. It is often the case that participants who rate an item high on a scale under one condition will rate other items high on that scale under other condition. Or participants with short response times for one task will have relatively short response times for another task. Et cetera. This positive association might be due to stable characteristics of people or transient differences such as mood. Thus, the increase in power is due to heterogeneity in how individuals respond to the stimuli. However, this advantage of within-subjects designs is frequently overridden in social psychology by the appeal of between-subjects designs. The latter are widely regarded as “cleaner” as they avoid carryover effects — in which one condition may effect responses to subsequent conditions experienced by the same participant. They can also be difficult to design when studies involve deception — even just deception about the purpose of the study — and one-shot encounters. Because of this, between-subjects designs are much more common in social psychology than within-subjects designs: investigators don’t regard the complexity of conducting within-subjects designs as worth it for the gain in power, which they regard as the primary advantage of within-subjects designs. I want to point out another — but related — reason for using within-subjects designs: between-subjects experiments often do not allow consistent estimation of the parameters of interest. Now, between-subjects designs are great for estimating average treatment effects (ATEs), and ATEs can certainly be of great interest. For example, if one is interested how a design change to a web site will effect sales, an ATE estimated from an A-B test with the very same population will be useful. But this isn’t enough for psychological science for two reasons. First, social psychology experiments are usually very different from the circumstances of potential application: the participants are undergraduate students in psychology and the manipulations and situations are not realistic. So the ATE from a psychology experiment might not say much about the ATE for a real intervention. Second, social psychologists regard themselves as building and testing theories about psychological processes. By their nature, psychological processes occur within individuals. So an ATE won’t do — in fact, it can be a substantially biased estimate of the psychological parameter of interest. These grey curves can be estimated if one has multiple observations per participant at different values of X. However, in a between-subjects experiment, this is not the case. As an estimate of a parameter of the psychological process common to all the participants, the estimated slope from a between-subjects experiment will be biased. 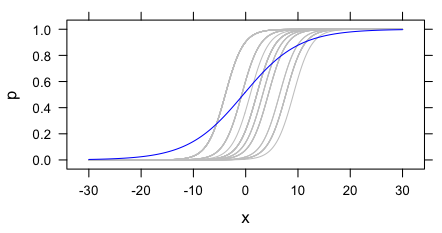 This is clear in the figure above: the blue curve (the marginal expectation function) is shallower than any of the individual curves. More generally, between-subjects experiments are good for estimating ATEs and making striking demonstrations. But they are often insufficient for investigating psychological processes since any heterogeneity — even only in intercepts — produces biased estimates of the parameters of psychological processes, including parameters that are universal in the population.